Although Paris is known for one of the most iconic tall buildings in the world, the residents of the City of Love hate the idea of another tall building ruining their beautiful skyline. The city of Paris is known for its mid-19th century style of low-rise buildings, with only the city’s greatest attraction elevated in the skyline. After the devastating creation of Montparnasse Tower in 1973, Parisians banned the construction of tall buildings which could destroy the impeccable views the city has to offer. Over the years, Parisians have come to accept some of the bolder architectural projects including the glass pyramids inside Louvre courtyard, and the Pompidou Centre – however they still hold a strong resistance towards skyscrapers. Four decades later, a new skyscraper has been proposed which could ultimately change the style of city. Swiss architects Jacques Herzog and Pierre de Meuron – includes the construction of a 42-storey triangular glass office tower, on the city’s southwest corner. Tour Triangle, as one of the most incredible pieces of sculpture that he has seen in ages. 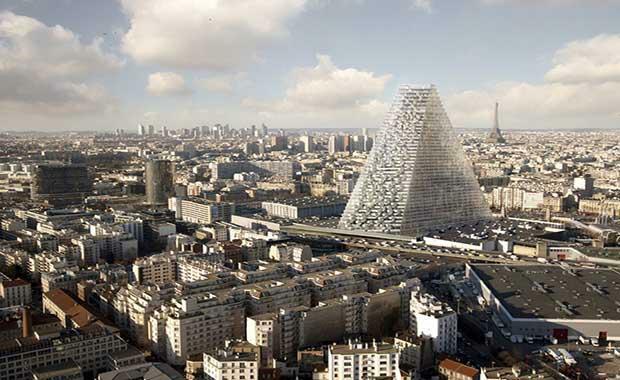 “There is this obsession in France that new architecture should not stand out,”Mr Nouvel said. “This causes a problem for towers, which must be visible and proud." The area which the proposed tower is set to be built on, is a collection of conference centres that lies beside the highway connecting the city to Porte de Versailles. The €500 million (AU$745 million) project will create 80,000 square metres of office space in a luxurious pyramid building. The Tour Triangle will create 5,000 new construction jobs throughout development. Jean-Louis Missika, Paris Deputy Mayor for Architecture and Urbanism, said there are many selling points to this project, including an important economic development for the city. Mr Missika says Paris cannot afford to lose the jobs and business taxes that the new tower will bring. If approved, the 180-metre skyscraper will become the third tallest tower in Paris, after the 324-metre Eiffel Tower and the 209-metre Montparnasse Tower. A private poll conducted in 2013 showed 62 per cent of Parisians were against the construction of the new tower. It is believed the tower will create a wall, shadowing the surrounding neighbourhood. Opposition member Nathalie Kosciusko-Morizet led the charge against the tower in the City Council. “We are not against modernity, but this is not about modernity,” said Ms Kosciusko-Morizet. “What we are hearing is the same argument that got us the Montparnasse Tower. Parisians fear that city officials did not learn from the Montparnasse disaster, a building which makes the list of the ten ugliest buildings in the world.